One of the hottest trends for this fall/winter is Fur. While I’m not a big fan of a total fur look, I do fancy fur detailed pieces either on the sleeves, collars, etc… So to celebrate the fur craze, here’s my contribution. A faux fur vest! Well…back to my outfit…this little silvery sweater is a size larger than what I normally wear. I wanted a relaxed look with a longer length ~ for when I’m feeling frisky to wear it alone as a dress ~ a very short dress! Fur is the latest vogue…it’s glamorous and fun ~ I’m just wondering if this is a fleeting trend or something we’ll enjoy for a few more seasons to come. What do you think? To Fur or Not to Fur? I’m linking with Silverstyle: Trending Through the Decades ~ Stripes. Check out the ladies in Stripes! This is about how I’m feeling today. Hope you’re having a better day! In order to keep my maxi skirts going through winter, I often throw on a longer sweater. I think this look is really elegant, and grey and black are so nice together this time of year. I’m so loving the maxi skirts this season! Hope to pick up a few colorful ones for the Spring! Beautiful skirt, it looks so comfortable. I’m happy to see those lovely silver accessories with this outfit – it looks great! Like you, I prefer faux fur as well, however I do have a few vintage family furs that I love and wear. Jeannie!! You look so glamorous in these photos!! That silver sweater and black maxi skirt are divine on you. 🙂 I love faux fur too, and I’m hoping it’s here to stay for awhile! You look stunning! I am following you from Rome, Italy. 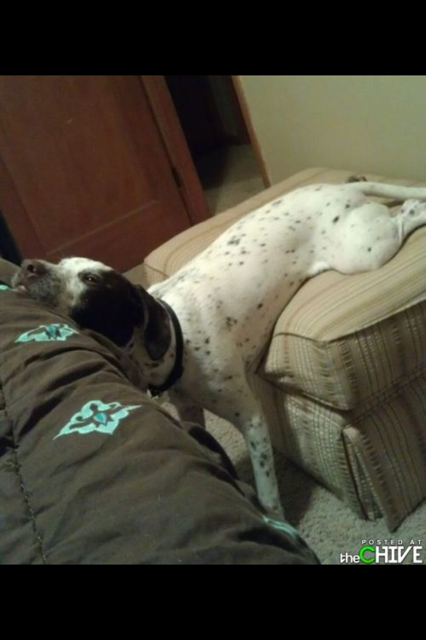 Your dog is so funny, just adorable, he looks exhausted! I think fur will be “in” for a while. It never really goes out, at least for winter, and I think with the new faux fur a lot of women who couldn’t afford the real thin(or won’t wear it for ethical reasons) will consider it. I have a short faux for coat I love and wear all the time. Love your outfit too! Those colors are really pretty on you. Thanks Heather! I don’t usually wear fur…not much of a need living in the South, but I can surely accessorize with it! I am so into them these days, and the fur vest is awesome as well! love, love love! you know I have an old mink coat that was my grandmother’s and it so out of style. I’ve worn it a time or two but what I’m thinking is having it made into a teddy bear with the inside embroidered name on the paw. I’d like to see it more than occasionally hanging in my closet. That’s an incredible idea! I wonder if I could find someone to do that for me. It would be better than just hanging in the closet like you said…will have to check into that. Thx! Great color combo and the long and lithe look of the long sweater over the long skirt is wonderful. So classy. Thank you much Bella Q! so fur has been around for 2 seasons now, how many seasons do things usually last??? I know a lot of people feeling that way…it must be the winter blues…it is even cold and dreary in South texas!! But, on the happy side of life, you look awesome as always…I am so envious of your great figure and how clothes look on you…fabulous!! You put together a wonderful combination again, as always in such beuutiful scenery. Makes me wish for a more outdoorsy life! I would say not to fur, but then again I’ve never really been into fur…. Thank you Sylvia! I’m truly blessed to be living in a scenic town with lakes and the mountains…it’s God’s country for sure! Such an elegant look. I do like the silver and black! I noticed you might be feeling like your deflated doggie friend – I hope you feel better soon! This week’s been very tough at the office…this too shall pass…things could always be worse. You’re very sweet. I hope the faux fur trend stays awhile because I to have a fur vest. Mine is longer in length, to just past my waist, and looks like mink. Wearing real fur is a personal choice. I think I’d feel too guilty wearing the real thing. Well, it’s not too cold here in Georgia either. I’m so glad you were able to get some ideas from my outfit post. That’s the greatest compliment I could hope for….just because I get inspired by others as well. Thank you!